When you hear the first few strains of John Williams's all too familiar score a wellspring of emotion begins to bubble in your gut. When you realize that bubbling feeling is not the triple-espresso-latte-enema you had this morning, and you see a silhouette of a man with a fedora on his head and a coiled whip at his side, you know that adventure and excitement await you at the flick of the next frame. You can practically hear the voice of a little Chinese boy with a battered old New York Yankees cap on saying, "Hang on lady, we going for a ride!" If you haven't guessed already, Indiana Jones the Adventure Collection was released on DVD today. No modern movie, since the rise of the French New Wave, has ever been as bare-knuckled, over-the-top, and as thrilling as the Indiana Jones movies. I remember a critic saying that the truck chase in Raiders of the Lost Ark had more fun and excitement than any so-called action movie out there. Hyperbole? Yes. Far from the truth? No. Steven Spielberg and George Lucas made a little movie paying homage to the Saturday matinee movie serials they used to watch as kids and promptly flew off into legend. Adventure movies have since come and gone but none have captured the imagination quite like Indiana Jones. 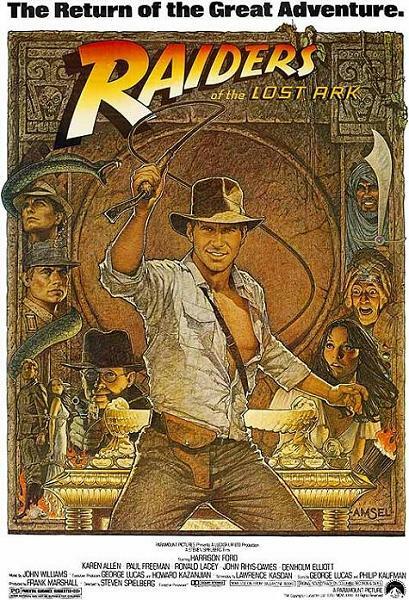 Take Raiders of the Lost Ark: an American archeologist is recruited by his government to beat the Nazis in a race to find the lost Ark of the Covenant. Along the way he recruits a beautiful former lover and a brawny Egyptian to help him in his quest to defeat evil and uncover the mysteries of the legendary Ark. The simple dynamics of good vs. evil, a hero (in this case a rogue scholar) fighting beyond his means to do what's right, and the triumph of human perseverance all make the film immensely entertaining. But its deeper message, couched in the presence of Almighty God, at the end of the film really take it to the next level from mere "movie" to true cinema. I mean, what a ballsy move. There's no way something like that makes it out of the editing room today. Indy would have gotten out of the ropes and somehow blown up the island as he and Marion leap to their safety into the cool, calm sea below. And as a passing American freighter comes to their rescue the Ark floats by, miraculously untouched by the explosion. Spielberg's ending was glorious: the all-consuming fire of God wipes out the blasphemous Nazis but our heroes are spared because they "honor the Hebrew God who's Ark this is" by closing their eyes to the inner secrets of the Ark. I don't think many filmmakers who attempt to emulate the success of Raiders understand the power of this kind of filmmaking. Are you saying something substantial with your movie – is there a piece of your soul in what you're doing – or are you merely trying to entertain us? The former is a poet. The latter is a clown. If you bought the trilogy when it was first released on DVD as The Adventures of Indiana Jones then you'd only want to buy the new one for the special features. There are different featurettes than the original DVD release but both sets are Anamorphic Widescreen and Dolby Digital 5.1. You can also buy each movie separately now, but why would you do that?